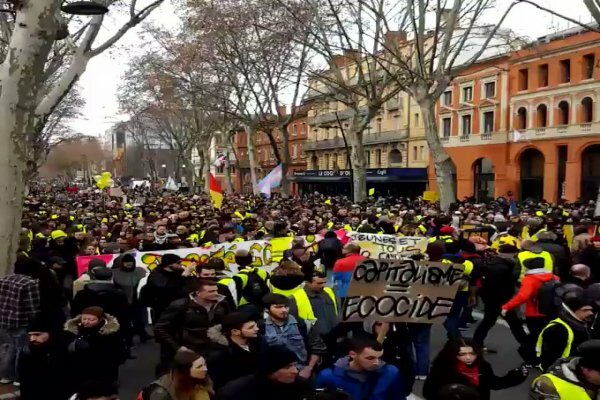 France's Yellow Vests are out again en masse - taking to the streets of Paris and other cities across the country for the 11th straight week of anti-government protests despite rainy conditions. Once again, the tear gas flew as protesters clashed with police - as documented by journalist Sotiri Dimpinoudis. #Update: Police now storming in the #GiletsJaunes protestors in #Paris who formed barricades and lit up some fires, in this #ActeXI protest. Yellow Vests on Facebook are now planning night protests, during which organizers asked participants not to engage in "violence" or "threatening behavior." "We’ll gather every night from this Saturday onwards, and we’ll keep coming till at least the end of the national consultation [Grand Debat]," reads one Facebook post. "We’ll make Place de la République our giant ring road." On Sunday, Yellow Vests have planned a human chain of 50,000 people along the "entire west coast of France, from Hendaye to Versailles," according to France Bleu. The human chain will converge with four other human chains.